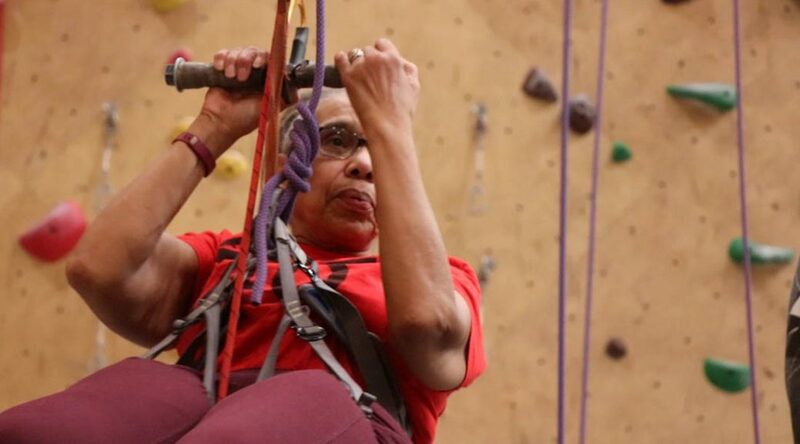 Schewe, a certified rock-climbing guide who has led beginner climbing groups for years, learned about the program from a friend who worked at RIC, now Shirley Ryan AbilityLab. “I showed up for the first climbing day, and I was hooked. I’ve been here ever since,” said Schewe. He now instructs adaptive climbing participants and volunteers each week. Schewe and other volunteers assess new participants to determine what modifications they need in order to climb. Some climbers, like Valentine, ascend a rope, rather than interact with the wall. Other participants climb the wall supported by a pulley system and a volunteer who climbs alongside them. Several others climb unassisted entirely, modifying the sport for their physical abilities, as any non-disabled climber would do. The physical benefits and mental challenges of adaptive climbing are not the only reasons ACG participants and volunteers come back each week. They also enjoy being part of a supportive and welcoming community.